Nope, us neither, but apparently the Silvestros is a concept design by freelance automotive designer Marco van Overbeeke who – it turns out – is one seriously talented guy. So too is previous bloggee Jeroen Ottens, who has reimagined Marco’s design in Technic form to create the stunning supercar you see here. A V10 engine lives up front, there’s a working transmission, all-wheel suspension, and functioning steering too. You can see all the images of Jeroen’s brilliant model at his photostream via the second link, and you can check out more of Marco van Overbeeke’s amazing automotive designs via the first. This is the ‘Ultimatum GTR V10’, it was suggested to us by a reader, and it comes from Pvdb of Eurobricks. It is – as you can see – a very pretty thing, and draws upon a number of modern supercars for inspiration. However it’s what is underneath the sleek bodywork that’s of most note. LEGO’s official 42056 Technic Porsche 911 GT3 RS set was exclusively revealed with a sequential paddle-shift gearbox here at The Lego Car Blog back in 2016, which made the anoraks in the office who spotted the feature very excited. The reality of this ground-breaking transmission however, was to be a colossal let-down. Bags of friction, only four gears, and they shifted in the wrong order. Not good. Pvdb’s supercar aims to address the shortcomings of the 42056 set with his own sequential gearbox, with five accurately spaced ratios, plus neutral and reverse, a compact design, and control via a racing-style sequential gear lever. The result looks miles better than LEGO’s own effort and you can check it out for yourself via Eurobricks at the link above, plus you can watch the transmission in action and build your own version of the Ultimatum GTR thanks to the instructions that have been made available on Rebrickable. Lexus LFA’s are like buses. You wait ages for one and then two come along at once. That’s where the similarity stops though. As per the other LFA post earlier this month a well-known presenter of a well-known motoring TV show (and its anonymous driver) claim that the Lexus LFA is the best car in the world. We wouldn’t go that far, but it is quite a thing. Spun from carbon using one of only two carbon-fibre looms in existence and powered by a sonorous F1-inspired V10 the LFA can lay claim to being one of the most unique supercars ever made. This superb Model Team replica of Japan’s iconic supercar comes from Noah L (aka Lego Builders) and there’s more to see of the build on both Flickr and MOCpages – click the links for all the images. Or so claimed Top Gear’s Jeremy Clarkson and the Stig. The Lexus LFA wowed the motoring world when it arrived in 2010. Over a decade in the making and built using one of only two carbon-fibre spinning looms in existence the V10-engined supercar shot Lexus into the automotive premier league. Just 500 units were manufactured in a two year production run and despite a base price of nearly $400,000 Lexus made a loss on every single one. You’ll need a lot more than $400,000 to get hold of one now though. But why such high praise? The LFA was built celebrate Toyota’s F1 success which never came, and it wasn’t the fastest, nor the best handling, nor the best looking supercar of its time. One reason; noise. If you’ve never heard an LFA, click here and turn the volume up! Previous bloggee gtahelper‘s Lego Lexus LFA may not be able to recreate the real LFA’s incredible sound, but in every other regard it’s one of the most remarkably accurate replicas that our Elves have ever brought back to the office. In fact we’re astonished that such a stunning recreation of a pretty tricky car can be made at this scale at all. A whole gallery of images of gtahelper’s Lexus LFA is available to view on Brickshelf, where there’s even a link to building instructions so that you can create your own. Click the link above to make the jump to check out the best model of the best car in the world. 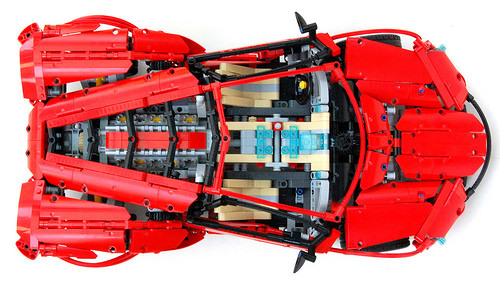 LEGO’s 42056 Technic Porsche 911 GT3 RS set did not fair well here under the Reviewer’s gaze. Over-priced and under-engineered, 42056 is – in that regard at least – quite un-Porsche-like. However the Lego Community have been taking their hands to the GT3 RS to see if they can do better. This is the latest 42056 B-Model effort to come our way, and it looks tremendous. Built by MOCpages’ Kasper Hansen, this Audi R8 V10 Plus almost exclusively uses parts from the Porsche 911 GT3 RS set, apart from the 3D-printed wheels (which are some of the most accurate replicas of the wheels from a real car that we’ve ever seen). The Lego Car Blog Archives are a scary place. Dark, forbidding, and – rumour has it – stalked by a band of long-feral Elves, it’s a part of TLCB Towers that this writer tries to avoid. Needs must though, as we were sure that this spectacular Technic Porsche Carrera GT had appeared here before. It turns out that it has, but builder Artemy Zotov has newly rebuilt his Porsche in an updated black colour scheme to coincide with the release of the model’s building instructions. Featuring a V10 engine, working steering and suspension, and a rising and retracting rear spoiler, Artemy’s Carrera GT is one of the finest Technic Supercars of recent times. You can check out the full details of the build at Artemy’s MOCpage, where you can now find a link to the model’s building instructions so that you can create your own! This incredible replica of Porsche’s mighty 2005 V10 supercar was discovered by one of our Elves on Eurobricks today. It’s the work of Artemy Zotov, and it’s one of the finest Technic Supercars that this site has ever featured. Artemy’s Carrera GT is a near-perfect one tenth scale replica of one of Porsche’s most ambitious vehicles and it features a wealth of superbly engineered mechanical functions, including the Carrera’s unique V10 engine, all-wheel independent suspension, working steering, opening hood, doors and engine cover, and the Porsche’s clever rising and retracting rear spoiler. There’s more of this stunning build to see at the Eurobricks discussion forum (and probably Flickr, MOCpages and Brickshelf too in the near future, but we’re quite early featuring this creation). Click this link to check out one of the finest Technic Supercars you’re likely to see his year. 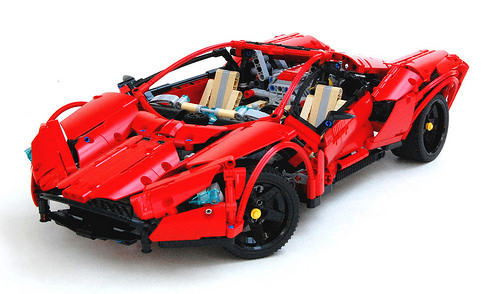 This interesting looking Technic Supercar comes from Eurobrick’s Anto. Taking inspiration from LEGO’s official Supercars from the ’90s there’s not a Power Functions motor in (or out of) sight, and instead old-fashioned mechanical goodness abounds. Working steering, independent suspension, opening doors, hood and trunk and a V10 engine and gearbox are all included, and you can read the full details at the link above. Fictional supercars rarely appear here at TLCB because they’re almost universally crap. However, previous bloggee Rage Hobbit has shattered our preconceptions with his superb looking ‘Wutzwerg’ Technic Supercar. It might sound like a German beer but Rage’s home-brewed design is a rather lovely thing to behold, and it’s backed up by some solid Technic engineering too, including full RC drive and steering, double-wishbone indecent suspension, a four speed gearbox and a V10 piston engine. You can read all the details and watch a video of the Wutzwerg in action on either MOCpages or Eurobricks – click the links for more. This brilliant Audi R8 V10 was uncovered by one of our Elves on Eurobricks today. Built by, er… Fanylover, it features good old fashioned mechanical Technic engineering (no Power Functions motors or infrared receivers here), including all-wheel-drive, a working V10 piston engine, double-wishbone independent suspension, working steering, opening and locking doors, and a retractable rear spoiler. Join the discussion and see more at the Eurobricks discussion forum – click the link above to make the jump. This enormous airport tug has been built by filsawgood of Eurobricks, and it’s something pretty special. Not only does it look – for a tug at least – rather good, it features a wealth of ingenious Technic engineering underneath, all operated by LEGO’s excellent Power Functions remote control system. There’s all-wheel-drive powered by two XL motors, independent all-wheel-steering controlled by two servos, a motorised elevating cabin, powered chassis jacks, a mid-mounted V10 piston engine, three IR receivers and two battery boxes. It’s an awesome bit of kit well worth your click, and you can see all the images and read the full details of the build at the Eurobricks discussion forum via the link above. Ah, special editions. If there’s one way to sell something it’s to make people think that what they’re getting is unique. From humble hatchbacks with new seat upholstery and a sticker stuck on the back to exotic supercars with… er, new seat upholstery and sticker stuck on the back, all manufacturers are at it. This is one of Lamborghini’s efforts, designed to help shift the lovely but ageing Gallardo in the run up to its replacement. The Gallardo Super Trofeo Stradale was launched in 2011, limited to a run of only 150 units, and Artery Zotov has just reduced the exclusivity a bit. His beautiful Technic replica of the rare bull comes with remote controlled all-wheel-drive and steering, independent double-wishbone suspension and a Technic version of the Lamborghini’s famous V10 engine. There’s more to see on Flickr and at the Eurobricks discussion forum – click the links above to make the jump. This bewitchingly beautiful Technic supercar was discovered by one of our Elves on Flickr. It’s been built by previous bloggee Jeroen Ottens and – as you can see – it’s a work of art. The beauty of ‘Misstress’ is more than skin deep too; underneath the deliciously curvaceous bodywork is a mid-mounted V10 engine, working steering and fully independent double-wishbone suspension. There’s a large gallery of superb images available to view at Jeroen’s Flickr photostream. Click on his name in the text above to see all of the photographs.